We are excited to personally meet and welcome you to our Lake Nona & Oviedo family! When you arrive at the office for the first time, you will be warmly greeted by our friendly concierge staff that will take you on a brief tour of the office and answer any questions that you may have. 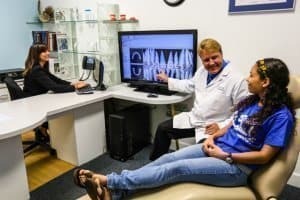 In order to do a complete and thorough exam and evaluation, Dr. Lach will have digital images (no radiation) of your face and smile, and digital x-rays (low radiation) taken of your teeth and jaws and will then review them carefully with you in detail. 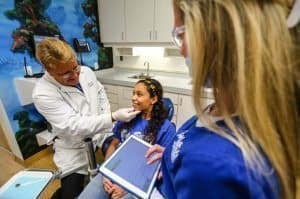 The Dr. Lach will then perform a full clinical exam, evaluation and assessment of your smile and discuss the findings along with any treatment recommendations if needed. What are the problems, if any? What can be done to correct the problem? How long will it take to fix the problem(s). What will be the short and long term benefits of fixing the problem? If treatment is recommended and agreed upon, our office is happy to combine or spread out appointments according to your personal preferences. Patients with lengthy treatment plans often prefer the added convenience of getting their braces the same day of their initial exam. Only patients who are under the regular care and 6 month maintenance by their general dentist are provided the option of receiving “same day braces” at the discretion of the Dr. Lach.